There’s a well-known direct response company that uses a “peer review” system for assessing headlines. This happens before the copywriter gets the go-ahead to write the full promotion. The copywriter writes 4-5 headlines … plus pre-heads, and subheads. The direct response copywriter also writes the lead. After submitting the proposed headlines to the copy chief and/or publisher, the copywriter makes some tweaks. Then the other copywriters review the headlines in a conference call. The “peers” give the copy a grade. If it’s at or above a certain grade, the direct response copywriter moves forward with the promotion. If it’s below a certain grade, the copywriter starts again. I’ve been a direct response copywriter for a long time now so I’m not afraid of a “jury of my peers.” I welcome the feedback. I have a thick skin when it comes to a review. A direct response copywriter is not here to win plaudits from other direct response copywriters. The goal is to get people to buy products and services. This peer review system strikes me as being fundamentally flawed. My problem is not with the other copywriters, it’s with the process itself. I can love a headline and lead. My client can love a headline and lead. 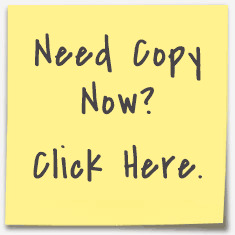 But when the copy goes live, we discover the following: the reader, also known as the CUSTOMER, fails to respond. Conversely, I can be so-so about a headline, and the other direct response copywriters can hate it, but then testing shows it’s an epic success. The views or otherwise of seasoned copywriters, while interesting, are ultimately useless. I’m only interested in what creates the highest conversion. So I have two final thoughts here. Don’t write for other copywriters. Write for the potential client or customer then see if the copy resonates. Start with a basic, “how to” headline. Or the straight offer. My experience shows these beat just about everything else in testing. The peer review system has some value. But real testing with real eyeballs is always going to be more valuable ... at least to this direct response copywriter. Other direct response copywriters have told me they dislike this review system ... to the point where they avoid this company. So the system is fundamentally flawed ... plus it keeps talent away from that company.